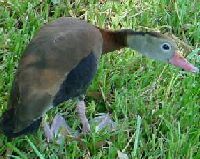 "Black-bellied Whistling Duck Nests, Eggs & Baby Birds"
"Nests, Eggs & Baby Birds"
Nest: It is lined with plant matter. Young precocial; leave nest 18-24 hours after hatching. Tended by both sexes for at least 144 days. Possibly 2 broods per year. "Dump" nests produced by more than one female laying eggs in a single nest are common, which results in documented neests containing more than 100 eggs. Will nest in tree boxes. 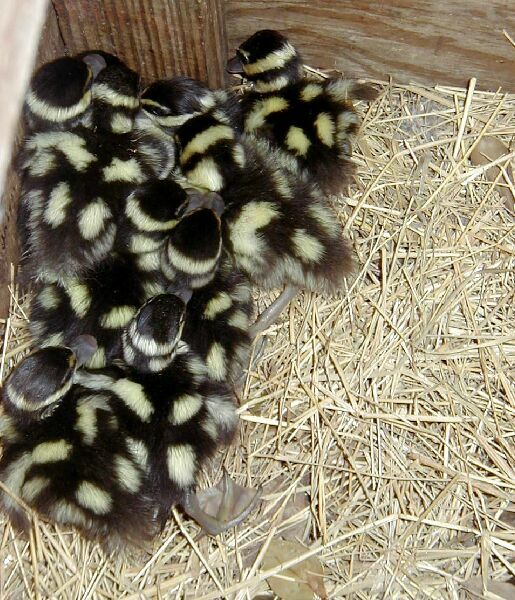 Eggs: 12-16 white eggs without a nest lining in a tree cavity or artificial nest box, occasionally on the ground among reeds. Incubation: 25-30 days by both male and female, but primarily by male. Habitat: Marshes, tree-lined shallow ponds, flooded woods. Food: Seeds, grain, insects and snails.